Saints clickedy-clicked back to winning ways on Friday evening with a 66-4 thumping of Huddersfield Giants. Saints fans are usually quick to express any disappointment or frustration on social media and it’s fair to say some fans were looking forward to the addition of James Bentley to Fridays 17 man squad. However, as we’ve seen throughout his tenure as Head Coach, Justin Holbrook doesn’t make changes just for the sake of it so Bentley had to make do with being 18th man on Friday. Fans shouldn’t criticise with hindsight, especially after such a big win. Holbrook has (so far) been vindicated for his team selections and the consistency he’s shown. If, and when, injuries start to bring themselves to the back row Bentley and Ashworth will get their chances to shine. As it was 2 recent graduates of the Saints Academy got the chance to stake their claim for a regular jersey. Matty Costello came in for the suspended Mark Percival and did well. He released Jonny Lomax for Saints first try of the night and fed Regan Grace for his great effort. 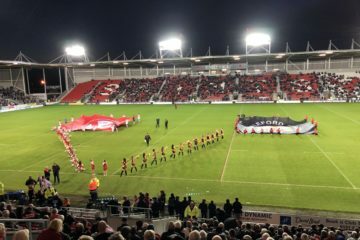 Going back to social media, on the Super League clip of Grace’s try, I saw some Saints fans lauding the fact Grace was given the ball and slating Mark Percival. They must have missed when Grace was bundled into touch by Jordan Turner after receiving a ball from his centre – proving that not every time a centre has the ball it should be thrown out to a wing man! Matty Lees also got another chance to shine, and he did really well. I overheard someone on the terraces near me say ‘Lees looks like he’d run through a brick wall if it was in front of him’. He’s been in and around the 19 for some time and his strong running looks like it will serve us well in the future. And while we might be disappointed that a few more youngsters haven’t been pitched in yet, lets praise the ones who have been trusted with the red vee and trust that the ones who haven’t are being prepared to do exactly the same. 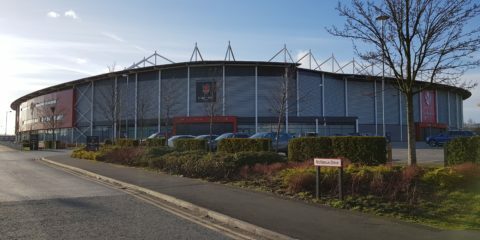 While Huddersfield were massively depleted, Saints deserved the 62 point margin of victory on Friday. But it was only after the game that I really appreciated how well we played. Some of the handling and offloads on show were tremendous, the decision making was in the main spot on. It was the perfect riposte to the performance against Wakefield, where we lacked a clinical finish and level heads to grab a match winning score. From the pack, Luke Douglas put in a barnstorming performance not seen in a Saints shirt so far. The confidence which oozed from him as he broke the Huddersfield line was amazing and it’ll be great to see him continue in this vein over the rest of the season. In the backs, I’m going to single out Regan Grace. Regan isn’t the biggest winger but will still put his hand up to take a run early in the tackle count. But after receiving the pass from Costello in the second half it was refreshing to see him back himself on a run. We have no idea if he’s been suffering with a lack of confidence but his mazy foray to the line, twisting the blood of Giants defenders was fantastic to see. As previously stated, Justin Holbrook loves consistency – the shirt is Grace’s to lose. Hopefully after proving he has the attacking talent, when given the ball in the right situation, he is another whos confidence will grow. A couple of other Saintly notes from the weekend. First of all, congratulations again to the St. Helens Womens Team who notched their second win of the season, this time away at last seasons champions, Bradford. I caught the first half and its obvious they’re a talented bunch, well coached and playing for each other. Their next game is home to Featherstone this Sunday, kick off 2:30, to be played at Thatto Heath Crusaders. It was sad to hear of the passing of former St. Helens second rower Roy Haggerty. I started watching Saints in 1990, towards the end of Roy’s career with us, so don’t remember too much about him in the red vee. 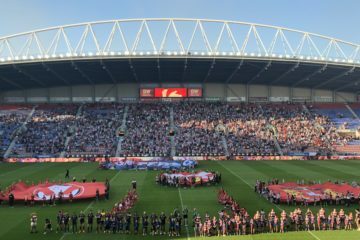 There are 2 well written pieces, one by Alex Service on the Official website and one by Mike Critchley from the St. Helens Star, which are must reads – if you haven’t already. Our thoughts and condolences are with the Haggerty family at this time.